With India emerging as one of the largest players in the telecom space, there appears to be excellent growth potential for Mobile related Value-added Services. The rate of addition of new subscribers, reduction in call rates, and success of interactive SMS services all point towards a high prospect for more VAS. However, significant challenges including lack of infrastructure, gaps in piracy protection, lack of transparency in revenue sharing, and rigid focus on only one sub-segment remain. In such a scenario, there are many ways in which a Mobile Virtual Network Operator (MVNO) model can fail. Two illustrations of such failures, one in a market similar to India, are provided. This would help a company wanting to enter the sector consider the risks involved and lessons to avoid similar mistakes. The aggregator model is found to be the best suited for the Indian market. 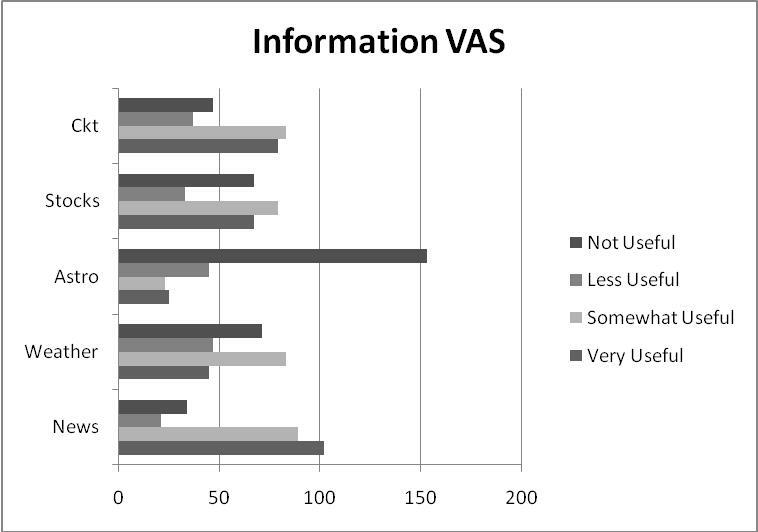 Also, a survey has been done to understand the potential of VAS in India. This has provided results which show consumer preferences along entertainment, information, and transaction services. These would help a company consider what services to provide. Mobile phones are becoming an extension of the individual himself and making phone calls is seen by many as just one of its utilities. Customers are increasingly making use of other services such as messaging, gaming, browsing, receiving stock information and cricket scores. More and more service providers have started catering such Value-added Services (VAS) and are coming up with new and innovative offerings. A Mobile Virtual Network Operator (MVNO) as a company that provides mobile service without having its own licensed frequency allocation and is seen as an entity that can specialize in providing these services along with providing customer service, customer billing, collection of consumption data, and handset management. However, the Indian context presents several challenges both regulatory and in terms of customer preferences. Proper understandings of these are needed for any company that wants to enter this space. The telecom market in India is the second largest in the world (the largest being China) with a wireless subscriber base of over 305 million (with 6-8 million subscribers added every month)1 . The Telecom Regulatory Authority of India (TRAI) regulates the market with directives for revenue sharing and unified access license. The Indian telecom market has both public and private players with a combined teledensity of 25%. By volume, wireless and CDMA capture 75% and 25% of the total market respectively. 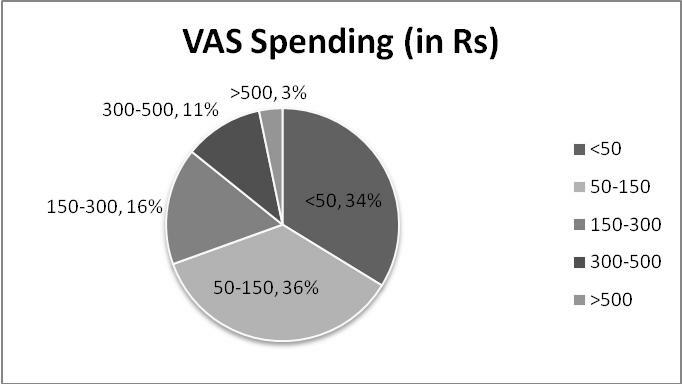 VAS contributes about 10% of the revenue in the Indian telecom market. Currently, VAS is dominated by entertainment services like SMS, ringtones, games, data and services like Multimedia Messaging Service (MMS) and Wireless Application Protocol (WAP). With network operators facing intense competition, call rates in India are one of the cheapest in the world. Low margins coupled with high customer churning have developed the need for services other than voice for differentiation. VAS will help retain customers and develop alternate revenue streams. There have been many factors which have led to the growth of VAS in the Indian market. Some of these are discussed below. The growth in VAS in India is being helped both by macro factors and by new market initiatives. High growth rates have led to higher disposable incomes, and people are ready to accept new technologies. Mobile phones and services have become a means of developing an 'extended personality' using personal ring tones and the like. Coupled with a reduction in call rates and new regulatory initiatives for lower costs of basic services, many more subscribers are entering the mobile category. 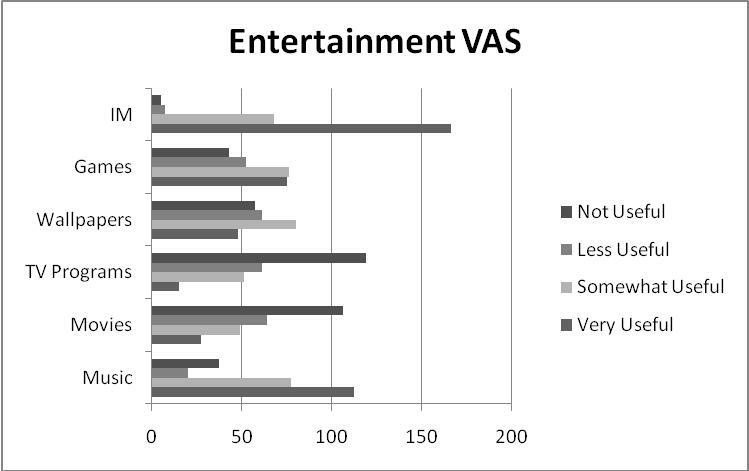 The current VAS focus on movies and music has been widely accepted. Interactive SMS participation for TV shows has led to new genres of TV programming. The market for mobile value-added services is currently about Rs 380 crore, and it is expected to grow to around 3,500 crore by 2010. All this holds a great potential for VAS. Broadly, service offerings would be made under Entertainment VAS designed for mass appeal and extensive usage, Information VAS with services providing useful personalized information, and M-Commerce VAS designed to help conduct transactions using the mobile phone. Both perceived value and practical value would affect revenue generation. 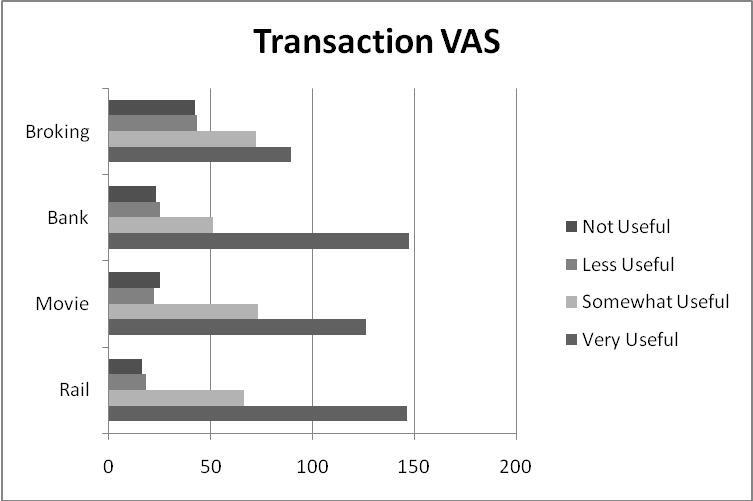 Perceived value of a VAS depends on the vicarious rather than the actual utility to the end user with no clear immediate benefit. It would largely depend on the marketing efforts. Practical Value is based on tangible benefits: those derived from services based on convenience and saving on time and money. In spite of these positive factors, significant challenges remain which can hinder the growth of VAS. Some major challenges that need immediate attention of key stakeholders are the limited youth focussed market, entertainment heavy content, lacunae in piracy protection for content companies, lack of infrastructure, pre-dominance of low cost handsets and high cost of services. These coupled with a lack of transparency in revenue sharing and an underdeveloped WAP market are acting as deterrents to the growth of the VAS market. The possibilities provided by an MVNO should be considered in this context. An MVNO is a company that may not (and usually does not) own part of the communications spectrum or network infrastructure, but uses its brand value and customer management capabilities to create a wireless company. As a "virtual" provider, the enterprise leases minutes of use from a traditional mobile network operator (MNO) for sale to its own customers. An MVNO partners with regular network operators to leverage its customer base using the sales channel. An MVNO needs a backend support system which can handle billing systems, and analyze service ratings while managing high task variety. It should provide Customer Relationship Management (CRM) services that form its crucial backbone. The system should be easy to use with high service quality management. Other crucial aspects relate to signalling and interconnecting for seamless integration along with Point-of-Sale (POS) support utilizing the customer data. A MVNO can enter the market through the Self Owned Model, where one would incur large upfront costs for installing the back end operations but benefit from economies of scale. It can also enter by partnering with a Mobile Virtual Network Enabler (MVNE) who would support it through its shared backend services. Here, all that one need is a good business idea and capital to fund it. The MVNE model involves the leveraging of assets across a wide customer base to lower costs. The Mobile Virtual Network Aggregator (MVNA) model is suitable for organizations with a small customer base that pool resources to have enough volume to be economically viable. It provides economies of scale to those companies that have a loyal and strong customer base and wide distribution network. When the player does not possess the expertise in the wireless arena and has a customer base that does not justify a very high financial risk in terms of large spending, the MVNA model is the best option. An MVNA pitches in here for these customers and facilitates deployment of services by acting as an intermediary between different network providers, handset manufacturers, and back-end platform providers - thus reducing the time to market and lowering the risk profile of launching a MVNO. The Indian market can be considered as a collection of 23 separate markets (corresponding to 23 telecom circles) for MVNOs. Though the three metro circles of Delhi, Mumbai, and Chennai possess characteristics that several other countries had at the time of their first MVNO launch, it would be premature to conclude that MVNOs can enter and operate profitably in these circles today. It is illustrative to look at the failures in the Singapore and South Africa (SA) markets which have been due to a variety of operational and regulatory reasons. This offers significant insights into the problems that MVNOs have faced recently. Poor positioning by targeting a highly competitive yet cash-strapped segment of the market (the young and trendy) which condemned them with low ARPU (average revenue per user). Lacking a strong brand name and effective distribution system in Singapore. Conflicting interests with its partner Singapore Telecommunications Ltd. - When Virgin ran into trouble with its low-end target market, it was unable to go after more affluent customers because that would infringe on SingTel's target, the mid-range market. In South Africa (SA), due to regulatory constraints, Virgin Mobile (VMSA) operated under the guise of an enhanced service provider in conjunction with Cell C3. The challenge in SA was that the model was introduced at a time when the market was almost saturated by the likes of Vodafone and MTN. VMSA pinned their hopes on leveraging the Virgin brand, improving customer services and subtle pricing differences. The latter two issues were well covered by the competition, which went to great lengths to protect their market share. Some of the challenges detailed above are true for the Indian market as well. MVNOs need to consider them when they make a decision of if and when they want to enter the industry. Also, knowing customer preferences are equally important in order to provide needed services. A survey has been done with this intent on understanding what most Indian customers want and how they like the existing services offered. A survey of 246 people conducted by the authors for the Indian market indicated that Mobile Value Added services are more valuable and suited for the 21-30 age-groups. More than 50% of the surveyed Indian consumers are spending above Rs. 500 a month on their phone bills (see Exhibit 1). It was found that more than 60% of the survey respondents would prefer a better experience. The need for MVNO services can be gauged by current usage of VAS where 65% of respondents were using such services at least once a week and 50% more than once. More than 66% of the respondents were willing to pay more than Rs. 50 a month for value added services of their choice. Among entertainment options, consumers find instant messaging to be most useful while they find TV programs on the mobile to be least useful (see Exhibit 2). The surveyed sample also have high utility value for some information services such as news while they found options such as astrology to be least useful to them (see Exhibit 3). Also, a predominant section of the sample (about 85%) find m-commerce to be very useful (see Exhibits 4). These include services such as banking and rail ticket booking. There are limits on Foreign Direct Investment (FDI) investments in MVNOs (the recent TRAI working paper on MVNOs does not clarify the status). Mobile Network Operators are also limited in investing in MVNOs. These issues, coupled with a high tax structure and problems in spectrum & licensing, pricing policy and norms for MVNOs on roaming agreements and subscriber data sharing, which are yet to be formulated, offer challenges. The MVNO revenue model was based on the NTT DoCoMo model4,5, of making money from 'wireless Internet' services. It was assumed that an MVNO's revenue would come from two sources - commission services from the content providers and per-bit fee, from their subscribers, based on volume. The results of the computation show that if the various VAS are available (subject to 3G licensing) we can expect a profit of Rs. 68.7 billion for the industry as a whole by 2011. Any firm contemplating entry into the VAS space in India must choose a MVNA model to enter this space, contingent to the easing of regulations, clarification on the definition of MVNOs, clear guidelines, and the launch of 3G services. Due to the regulatory constraints in place at the moment, MVNOs cannot operate as it is. However there is considerable progress in this direction and we could potentially see a redefining of rules that govern the MVNOs in future. Rules for 3G licensing have also been announced, paving the way for the launch of new services. We suggest that any firm contemplating entry into the VAS space in India choose a MVNA model to enter this space, contingent to the easing of regulations, clarification on the definition of MVNOs, clear guidelines, and the launch of 3G services. Results from the survey (Exhibits 2, 3, and 4) provide a good guide on what services Indian consumers want from an MVNO. There is significant potential for a VAS player in the Indian telecom market. However, there are constraints in the form of a cap on allowed foreign investment and the delay in the rolling out of 3G services right now. But with these restrictions expected to be lifted soon, the more important considerations for a firm are the form it should take, its role with the existing network operators, the customer segments it wants to target, and the services it needs to provide in order to succeed. The MVNA model appears to be the best suited for the Indian market and the survey results also indicate what Indian customers want most. TRENDSnIFF, 2008, 'Mobile Phone Subscribers August 2008 - China and India', September 26, 2008, http://trendsniff.com/2008/09/26/mobile-phone-subscribers-august-2008-china-and-india/ Last accessed on Nov 30, 2008. Robert Clark, 2002, 'Fall in Singapore ends Virgin's Asia dream - New Analysis - Virgin Mobile Asia-Pacific closes mobile virtual network operator business - Brief Article', Telecom Asia, August 2002 http://findarticles.com/p/articles/mi_m0FGI/is_8_13/ai_91204588 Last accessed on Nov 30, 2008. Chimwemwe Mwanza, 2007, 'The usual suspects', FinWeek, April 2007 http://mybroadband.co.za/nephp/?m=show&id=6051 Last accessed on Nov 30, 2008. Raimond A. Linsenmayer, 2001, 'Secondary Spectrum Markets in Europe', Thesis, May 2001. Dong Hee Shin and Michael Bartollaci, 2007, 'A study of MVNO diffusion and market structure in the EU, US, Hong Kong and Singapore', Telematics and Informatics, Vol 24, pp 86-100.